HA NOI (VNS) — Following oil and gas companies, bank stocks rose strongly yesterday afternoon, pushing the VN-Index up another 0.67 per cent to close the session at 568.28 points. The market condition was positive on the HCM Stock Exchange as advancers outnumbered decliners by 105-85 and 118 stocks went flat. Bank shares were the biggest gainers in the afternoon session with most large-cap lenders gaining value, including Vietcombank (VCB), Bank for Investment and Development of Viet Nam (BID), Vietinbank (CTG) and Sacombank (STB). PetroVietnam Drilling and Wells Service Corp (PVD) continued its uptrend, hitting the ceiling price for the second day. PV Gas (GAS) retreated to the reference price by the end of the session. Blue chips maintained the market momentum with 19 stocks of the top 30 shares by market value and liquidity. The VN30 went up by 0.73 per cent in value to end at 595.09 points and liquidity also improved. The market volume climbed 20 per cent over Wednesday, totaling 100.5 million shares while value of trades rose 10 per cent to reach VND1.83 trillion (US$84.7 million). With a good business performance released yesterday, auto dealer Hoang Huy Investment Services Co (HHS) claimed the most active position with 6.8 million shares traded and shares leaping 3.2 per cent to finish at VND19,500 ($0.90) a share. HHS reported VND594 billion ($27.5 million) in revenue and VND191.5 billion ($8.9 million) in net profit in the first quarter of this year. The company announced it completed the takeover of Hoang Giang Services Development Co with a holding of 99.78 per cent stake. This deal brought the firm a goodwill value of VND119.5 billion ($5.5 million). HHS paid only VND479 billion to purchase Hoang Giang's shares even though the company's net asset value reached VND598.5 billion at the time of purchase. 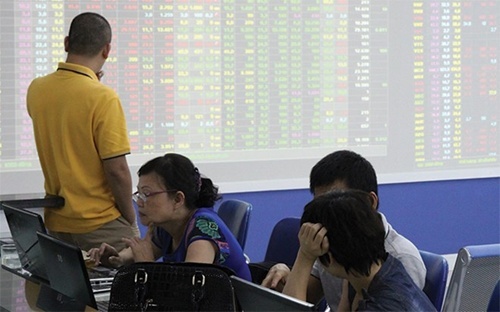 On the Ha Noi Stock Exchange, the HNX-Index also rose to a three-week high at 83.40 points, up 0.44 per cent over Wednesday's close. Trading was a respectable 52 million shares worth VND729.5 billion ($33.5 million), up 20 per cent in value over the previous session. KLF Joint Venture Global Investment Co (KLF) reclaimed the most active stock position with 4.3 million shares traded, ending flat at VND8,800 a share.